The Undoing Project by Michael Lewis was the latest book from the bestselling author who I've now read eight book by, with the others: Flash Boys, The Big Short, Boomerang, The New New Thing, The Blind Side, Moneyball, and Home Game. 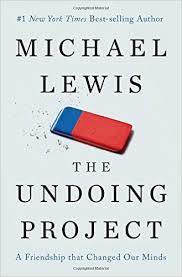 The Undoing Project has the subtitle A Friendship that Changed Our Minds and is about Daniel Kahneman and Amos Tversky, Israeli psychologists credited as the forefathers or at least popularizers of the fields of Decision Sciences and Behavioral Economics. Lewis details in the book how the two men greatly influenced people including economists and writers Richard Thaler and Cass Sunstein, NBA General Manager Daryl Morey, and Lewis himself, with Moneyball being in many ways about the need to mistrust intuition, and the work of Kahneman and Tversky about where the bias behind that intuition comes from. Much of the contribution from Kahneman and Tversky was about how people make decisions, and how their choices get framed by circumstances. People develop beliefs and make decisions not in a vacuum, but out of the context around them that leads to those beliefs and decisions. Along with The Undoing Project being on the work of Kahnman and Tversky, Lewis also very much wrote a biography of the two men, starting from childhood, then with each in the Israeli military, later close collaborators, and with their relationship strained prior to Tversky's death. It's noted in the book that Israelis were interested in people and what made them tick, and both men brave soldiers, with each brilliant, and yet having wildly diverging personalities. Kahneman at times felt like he wasn't developing fully his ideas, whereas Tversky's views commanded attention from early in his career and he certainly seemed both aware of that and to bask in it. Additionally, Tversky was combative about his ideas and decisive regarding his time and attention, with Lewis writing that "his likes and dislikes could be inferred directly and accurately and at all times from his actions." Part of the book by Lewis was very much about the difference between the men and how they drifted apart. From later in Tversky's career I found compelling mention of how he was brought in by the Training Department of Delta Airlines to help improve pilot decision making, and the result of that was an encouragement of co-pilots to more readily question pilots and their actions, basically to work on the circumstances around which decisions are made to improve the odds of the correct ones resulting. Lewis noted at the end of the book how after Tversky died, Kahneman continued producing well-received work and is the author of the best seller Thinking, Fast and Slow and The Undoing Project presents a really thorough look at the men, their work, and how they influenced those to follow.